Pipedrive was built to keep things simple. By allowing you to visualize your sales process and follow-up with the right activities, your efforts become more effective and your closing rate starts to climb. Sales is not just about pipeline management. To succeed as a salesperson you also need to manage contacts, generate leads, and keep track of contracts, invoices, etc. Until now, Pipedrive supported these extra sales activities with additional tools on our handy integrations page. But we came up with a better solution. After lots of planning and preparation, we at Pipedrive proudly announce the launch of our unified solution to managing all your extra business tools: the Pipedrive Marketplace. Not only do you have an easy overview of what you and your team use, but you can also browse an ever-expanding directory of integrable apps for your unique pipeline. 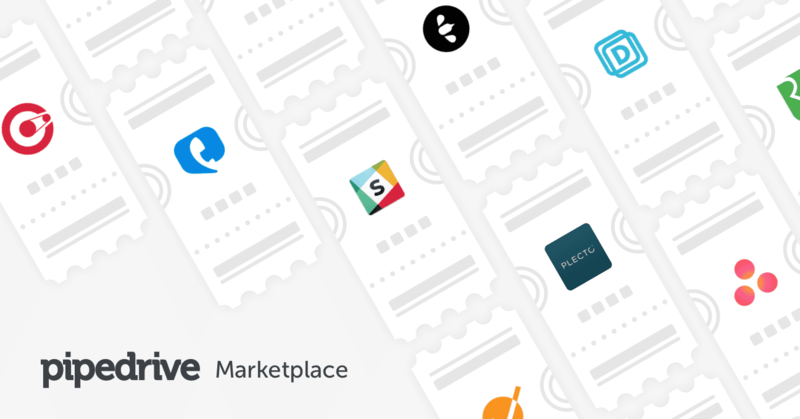 Adopting new apps or ditching outdated solutions becomes simple with the unified overview the Marketplaces gives you. When all your apps are managed in one place you get a clear overview of the tools at your disposal, and what you might be missing. Still curious? Get an inside look at the new Marketplace. 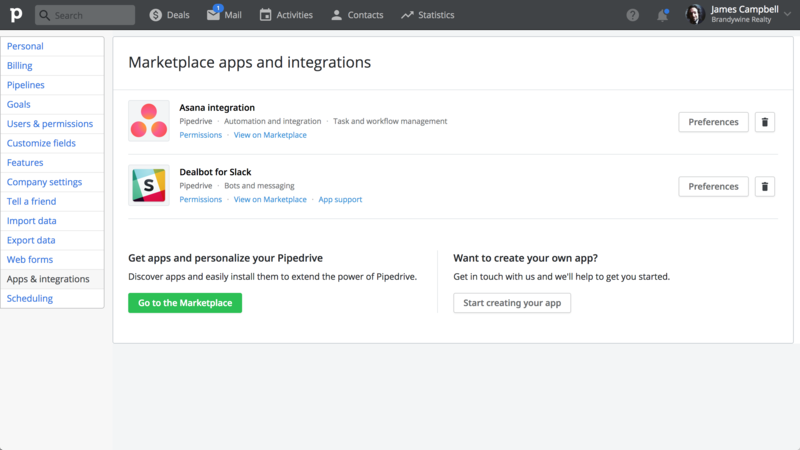 You can also access the Marketplace inside of Pipedrive itself. Just head on over to Settings > Apps & integrations. We’ve teamed up with the best and brightest sales innovators and developers to offer you a robust arsenal of tools to take your Pipedrive experience to the next level. Below are just some of the great tools provided by our dedicated partners. With nearly 100 different partners working with us, you can expect to see plenty of new capabilities infused into your future Pipedrive experience. 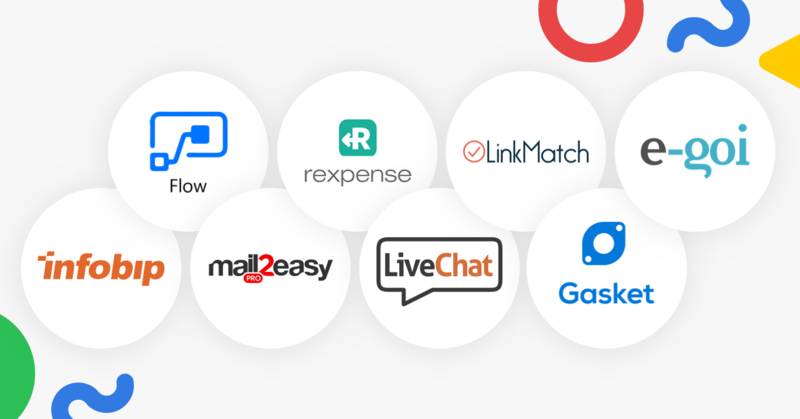 Plus, all our previous integrations will be joining this growing list as awesome apps, so stay tuned. Want to see your company on our app list? Getting access to the resources you need to create your own Pipedrive integrations is easy peasy, and you can find everything you need to know on our Developers’ Corner. Designed to help engineers contribute to the Marketplace, our Developers’ Corner gives you full access to our open RESTful API resources, including tutorials, guides, and detailed documentation to help you create your own app masterpiece. We encourage Pipedrivers to create their own custom integrations. After all, who understands your team’s unique needs better than you do? We aim to provide all the resources you need to develop tools for not only your team, but for others teams that may benefit from it. As soon as your app is approved by our team it will be available to other Pipedrivers on the Marketplace.